As a former Social Studies Teacher, Juvenile Probation Officer, 2nd Amendment supporter, NRA member and security company owner, my opinion on the nationally debated topic of arming classroom teachers is based on more than 40 years of professional and personal experience. Recently, a program to train and arm school staff members in nearby Tamaqua School District, in Schuylkill County, Pa. has been put on hold as two lawsuits against the school district make their way through the court system. While school districts in other parts of the country have already adopted armed educator programs, the Tamaqua School District would have been the first one in my state. I can’t think of a more opportune time to voice my opinion on arming public school teachers. Bluntly stated, I’m against it. Gun violence in our country is at epidemic proportions and active shooters are a symptom of that problem. We all agree that increased campus security is greatly needed, but turning teachers into armed officers is a recipe for continued heartbreak. The best answer to combat school shootings is to have members of the local police department in every school. Besides having an armed, highly trained law enforcement professional on patrol, the social benefits of exposing our youth to positive community role models would be invaluable. Knowing that the cost for police officers to be in every school would be unsustainable for taxpayers, that leaves us with two basic options: Train and arm the teachers or hire an armed security guard company. 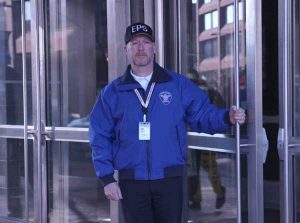 I stand on the side of partnering with an armed security guard company… and here are just a few reasons why. 1. The arming of teachers in no way replaces a professional security staff as educators with a secured sidearm would be no match for the barrage of an assailants’ semiautomatic rifle. Assuming school budgets and time restraints could provide teachers with adequate weapons training, educators with little or no “immediate back-up” coupled with “inferior firepower” could never replace the proactive duties or immediate response of properly trained and certified security officers. 2. There is no question that every teacher and student deserves the right to a safe and secure environment in which to learn, but our teachers never signed up for the double duty of educator and armed guard. In fact, national studies suggest that most teachers do not want to carry guns, and would not avail themselves of the option to do so. This could easily create an imbalanced system where some school teachers are armed, and others must wait for the police to arrive. Teachers do not want to be security guards, they want to be educators. Professional security guards can maintain an authoritative rapport with students to stay well informed of threats or perspective unwanted behavior. Professional guards also act as good-will builders with responsibilities to assist visitors and help students. Most school shootings are carefully planned, and students can easily find out which teachers are most-likely to be armed. Either way, it means that those teachers become the first targets. In addition, shooters often have experience with their target school and therefor know the layout, bell schedule and access control weaknesses. However, if security guards are posted and follow smart access control protocols, the school becomes a much harder target. 3. The idea that a shooter would see an armed teacher as a credible threat is incorrect, because in the most recent school mass shootings, the perpetrators were suicidal and ready to die. However, if that shooter knows the school is less vulnerable due to consistent access control lock-down drills, and vigilant armed guards the shooter may choose a softer target. To suggest that we should arm teachers because gun-free zones invite shooters, ignores common sense and research. 4. Arming teachers creates an increased liability for them, school administration and their school district. Research shows, that individuals who own or have access guns are statistically more likely to have gun-related accidents than use than ever use the gun for self-defense. The same holds true for armed teachers, especially when you considers that a school environment has more opportunities for “incidents and accidents” than private homes. The financial liability to the school alone, makes the idea of arming teachers unrealistic. Add the general lack of school funding and the idea becomes even more untenable. Since all reputable security companies are licensed, bonded and insured, it’s also bad business for a school to spend their limited funds for extra insurance, rather than educational needs. 5. By arming teachers, we are essentially asking educators to make a choice between securing their students or pursuing the active shooter. A highly trained security officer doesn’t face that moral impasse, because it’s their job to engage the shooter while the teachers safeguard the students. 6. If you’re a leader in your community, it’s your moral duty to ensure the safety of the students, teachers and visitors in your school district. Please take my advice and follow these simple steps. 1. Invest in a vulnerability assessment for your campus. 2. Develop a comprehensive security plan that includes guards and technology. 3. Hire a reputable security firm to partner with to execute your plan. 4. School shootings are not an act of sanity. You can you prepare for irrational behavior by preparation and practice… prepare and practice.